My name is Marc Haynes and this site is dedicated to the off-beat history, stories and sights of London and its inhabitants. 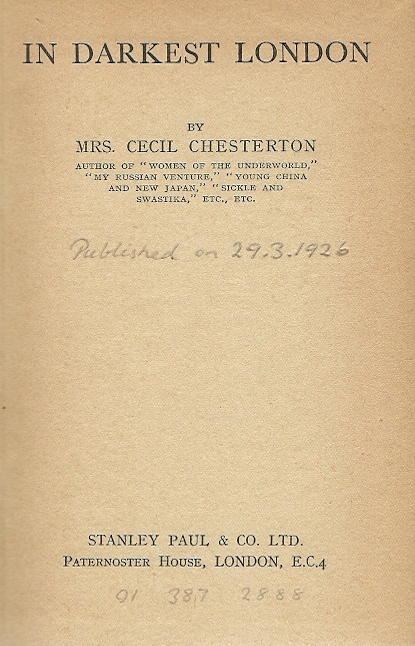 Darkest London takes it’s name from In Darkest London (1926), a book in which one Mrs. Cecil Chesterton went undercover to report on the conditions of London’s outcasts. It’s really worth a read. You’re bound to find a cheap copy on Abebooks. Submissions are warmly welcomed, but please be aware this site does not publish fiction and there is no payment for contributions. This site is non-profit making. It’s done out of love. As such, I’d ask you not to take big chunks out of it to use for your own ends, and the same goes for the photos here. If you only speak business-talk, then here’s my copyright thingy. © Marc Haynes 2010-2014. Unauthorized use or duplication of this material without written permission is strictly prohibited. Excerpts and links may be used, provided that full and clear credit is given to Marc Haynes or DarkestLondon.com with appropriate and specific direction to the original content. If you wish to tell me I’ve got something wrong, want to add to what’s already there, ask me to remove something, have any copyright concerns, would like to reprint anything from this site, or just want to say hello (I’d like that), please contact me either through this page, or via london1860@hotmail.co.uk. We stumbled across your website during some researches on London, for a University project, we love it, it’s great!!! Keep on writing, please! Cecilia, Esther and Kat. I think might be the strangest Documentary I have ever watched…. Don’t suppose you have a digital copy of ‘In Darkest London’… can’t find it in any libraries! Just started blogging myself (very much a latecomer, clearly) and already know how nice it is to get comments, so thought I’d write. Fascinating facts I’ve found on here, really fascinating. All the best! Thank you, Marc. I identified with your descriptions of all those grotesque glass monstrosities. I went last Friday to walk the area of Keats’s young childhood (I am a Keats scholar and working on a book about him) – and wanted to weep. The area around the London Wall and Old Street are even worse than when you described the devastation of the pubs here. The Old Street roundabout is an example of the worst of modern day ‘planning’. The hideous towers which lurk over it look ridiculous in their immediate environment. Hundreds of people rush about the roundabout, but there is no sense of the human being here. It is a soulless desert. Everything I went looking for has vanished beneath the monsters that rise from their ashes. Apart from the Globe pub. The Keats at the Globe now sits beneath a modern structure. Next to it is a old three story building and next to that is a huge void that is yet another building site. The little street behind the Globe is abutted by a HUGE glass thing. The street is only half there now, and blocked off because behind the huge glass thing is yet another enormous void with cranes and development site stuff. There is no sense of scale and decorum in any of this development – as with all the other areas of central London. Sorry for rant. I am KICKING myself for not doing this visit 5, 10 years ago before the worst damage was done. Even Corsham Street, which was called Craven Street in Keats’s day has NO old buildings. By the way, we do know that the Keats family lived in Craven for a few years before relocating back to the Swan and Hoop. Thanks for reading – if, indeed, you have! I just stumbled upon your story about the short tragic life of Allegra Byron. Informative and heart-wrenching. Thank you! I will definitely be back to read more! Thank you, Marc, for the enlightening, detailed information on Allegra Byron! Just found yr site whilst trying to track down the old pubs on London Wall, where I am currently based. Having worked/ drunk in the City for the past 41 years, I would be v happy to provide any updates should you require them. Re the Stirling Castle and the plaque that reads ‘SCS 1886’, if noone else has been in touch, it is an old Parish boundary, indicating the extent of the long gone St Stephens, Coleman Street. I guess the WAH 1799 refers to All Hallows, further along London Wall, but will pop in to confirm next time I see the church open. Having worked in the City for the past 41 years and frequented almost all the establishments in Part 5, I would be v happy to provide any updates should you require them.